Hello! My name is Makayla and this blog is about my journey towards my dream to be a nurse practitioner. But because life is made up of several dreams, I just had to add "and stuff" to accommodate everything in the wonderful life God gave me! :) Questions and Comments are welcome! Lately I have been really interested in different cultures. Don’t get me wrong I’ve always loved learning about different cultures but lately my interest has spiked quite high! I love learning and one thing is always interesting and quite constant is cultures. There is just something so rewarding about knowing the language, the culture norms, beliefs, the food, music, holidays and lives of people around the world. I love to read about other people’s traditions, their taboos and most importantly their fairy tales and legends. 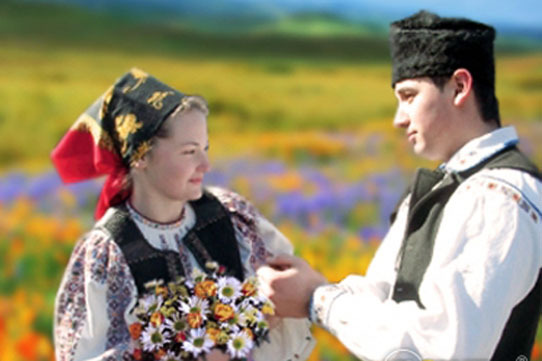 However today, February 24th, is the Romanian holiday of love, called Dragobete. Unlike Valentine’s Day that is named after Saint Valentine and those he helped, Dragobete is more connected to nature than it is to people. It is more specifically linked to the time of year that birds build their nests and reproduce. Translated roughly to “when the birds get engaged”. Celebrated on the 24th of February, it is when the first signs of spring appear, more importantly it is when the birds start to nest and choose a mate and the cycle of nature begins. As most legends go, there are always a ton of different versions to the story. One version is that Dragobete is a symbol of true love and spring. He always brought love and joy to everyone, especially women. While his mother, Dochia, is said to be the exact opposite. She symbolized harsh winters. Dochia sends her daughter in law to fetch berries in the month of February (which is impossible so early in the year) and God helps the daughter in law in this task but as always, tragedy strikes. Dochia believes that spring has come early and in doing so takes her son, Dragobete, and her flock of sheep up the mountain. The legend says that she had to carry twelve lamb skins with her and that she ended up losing them all. But because spring hadn’t quite arrived yet both Dochia and her son freeze to death on the mountain. Other versions talk about how Dochia was actually a lovely woman who wanted to tease spring by taking a few days in February, in doing so she created the month of March to be a rocky month of both rain and shine. Which is where we get our “lion and the lamb” phrase for the wacky weather in March. Since Dochia took the few days in February, the birds started their cycle early and in doing so changed the way of the humans, who copied nature’s own rituals. It is said that if a man chases a woman and she lets him catch her. He must kiss her in front of the village so that they can be married in the coming year. In either version, Dragobete is always spoken as being the purest form of love and of how Nature’s way of life is copied by human beings, the endless cycle of rebirth and of love. If you wish to know a little bit more about Dragobete, Ramona Crisstea’s blog has a wonderful post on it. You can view it here. Do you celebrate Dragobete? Have you ever heard of it? Perhaps you know a different version of the legend? I’d love to hear it! Thanks for the reblog! Happy Dragobete!